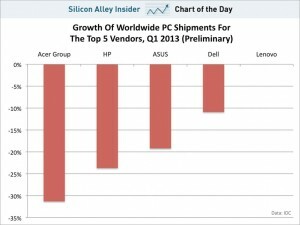 IDC says PC sales fell 14 percent in the first quarter on a year-over-year basis. That’s worse than its forecast of a 7.7 percent drop. This is the worst quarter for PC industry since 1994 when IDC started tracking sales. So, that pretty much makes it the worst quarter in history. IDC blames Microsoft’s Windows 8 operating system for alienating consumers. The new tile-based interface is too weird for consumers, says IDC. Instead of buying new laptops or desktops, people are buying tablets and smartphones which serve as good-enough alternatives. This entry was posted in 'Cloud' computing, iPad, Technology by jjn1. Bookmark the permalink.